Home / Articles / 2019 / Got data? We’ve got an engineer for you. Smart Industry: Define your role as an analytics engineer. Michelle: As an analytics engineer I help engineers and companies get the value out of their data. All of the analytics engineers at Seeq come from industry, so we know the challenges and opportunities that are associated with process data. We give engineers the tools they need to do their job more effectively and efficiently. We are the people that help when you have an idea of something that you want to do but don’t know how to make it happen. I personally enjoy teaching people how to save large amounts of time and money. Michelle: I think we are at a turning point where businesses are starting to recognize the importance of data-informed decisions. We have more and more companies telling us they need Seeq and wished they had it 10 years ago. Even the companies that do want to have more data-informed decisions usually don’t realize the magnitude at which it affects the bottom line until they get started. The companies that are behind and haven’t realized the need for this yet are usually focused on other problems that need to be fixed before they can focus on their data strategy. Smart Industry: Provide a recent example. Michelle: Every time I train a customer or give a demo of our software to a potential customer I get more mind-blown reactions. Recently, on the second day of training a new customer, an engineer solved a use case where all he had to do was add a cooler to increase production. The increased production was worth $20 million per year. This analysis couldn’t have been done before Seeq and was done in less than 30 minutes with our tools. Customers feel so empowered when they have the right tools to do their job effectively and get results. Everyone wins because engineers are happier and more productive, which in turn saves the company money. 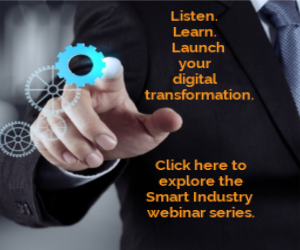 Smart Industry: Provide your perspective on "data contextualization." Michelle: Data contextualization is so important in the process industry. There are always various modes of operation or conditions that are present. In order to effectively perform an analysis on process data you must compare apples to apples. This is done by contextualizing your data so that you are comparing relevant data. Whether you have a batch process and need to compare one batch to another or a continuous process and need to compare times when you were running in a certain mode or above a certain level, contextualization is key. With Seeq, it’s easy to contextualize your data and even layer contextualizations on top of each other so that you could look at something like when valve A is open, pump 1 is on, and the flow rate is over 300 in a matter of minutes.